The name of our laboratory is “Molecular Nutrition and Toxicology”. We are focusing on molecular nutrition and toxicology of metals. Metals such as zinc (Zn), iron (Fe), and copper (Cu) are known to be involved in more than 10% of gene products as enzymatic co-factors or structural components. Dietary deficiency of a certain metal as a trace element causes nutritional deficiency syndromes, whereas excess intake of the same metal causes toxic health effects. To uncover whole profiles of biological actions and roles of metals, which are related to both nutrition and toxicity, application of multiple tools in the fields of genetic, biochemical, chemical, and epidemiological studies are required. In addition, we Japanese experienced heavy metal intoxication such as Minamata-disease and Itai-itai disease, but even 50 years after the discovery of these diseases, molecular mechanisms of metal toxicity and transport remain unclear. The major projects carried out in our laboratory are as follows. Arsenic is a well-known toxic metal, but the molecular mechanisms of its toxicity and metabolism remain still unclear. Some arsenic compounds are used as a pharmaceutical. 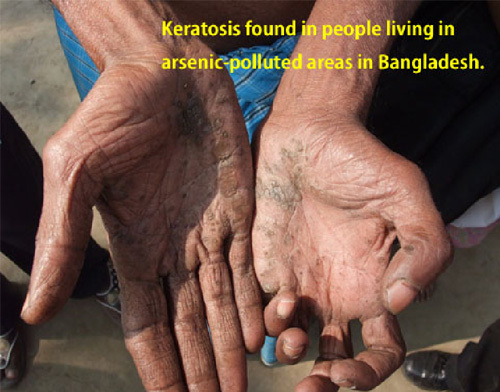 We are currently studying the molecular mechanisms of arsenic toxicity and metabolism by using cultured cells and human samples obtained in arsenic-polluted areas in Bangladesh and Cambodia. (Ref. 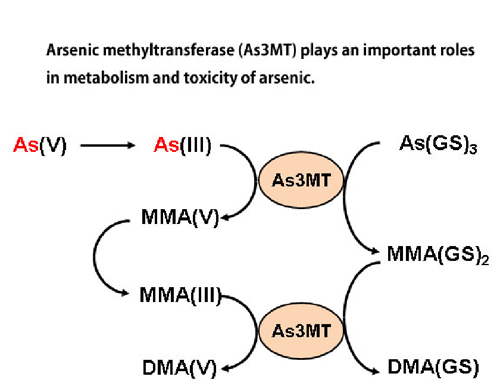 1, 2, 3, 6, 7) (See Figs 2 and 3) Clarification of molecular mechanisms of biological actions of arsenic may also pave the way to apply arsenicals to clinical use in more efficient and safer way. Fujishiro, H., Yoshida, M., Nakano, Y., Himeno, S. Interleukin-6 enhances manganese accumulation in SH-SY5Y cells: Implications of the up-regulation of ZIP14 and the down-regulation of ZnT10. Metallomics, 6, 944-949 (2014). Nanayakkara, S., Senevirathna, S., Abeysekera, T., Chandrajith, R., Ratnatunga, N., Gunarathne, E., Yan, J., Hitomi, T., Muso, E., Komiya, T., Harada, K., Liu, W., Kobayashi, H., Okuda, H., Sawatari, H., Matsuda, F., Yamada, R., Watanabe, T., Miyataka, H., Himeno, S., Koizumi, A. An integrative study of the genetic, social and environmental determinants of chronic kidney disease characterized by tubulointerstitial damages in the North Central Region of Sri Lanka. J. Occup. Health, 56(1), 28-38 (2014). Migita, S., Moquin, A., Fujishiro, H., Himeno, S., Maysinger, D., Winnik, F. M., Taniguchi, A. Quantum dots induce heat shock-related cytotoxicity at intracellular environment. In Vitro Cell Dev Biol Anim., 50, 367-72 (2014). Fujishiro, H., Ohashi, T., Takuma, M., Himeno, S. Down-regulation of S100A9 and S100A10 in manganese-resistant RBL-2H3 cells. J. Toxicol. Sci. 38(5), 753-757 (2013). Karim, M. R., Rahman, M., Islam, K., Mamun, A. A., Hossain, H., Hossain, E., Aziz, A., Yeasmin, F., Agarwal, S., Saud, Z. A., Nikkon, F., Hossain, M., Mandal, A., Jenkins, R. O., Haris, P. I., Miyataka, H., Himeno, S., and Hossain, K. Increases in oxidized low density lipoprotein and other inflammatory and adhesion molecules with a concomitant decrease in high density lipoprotein in the individuals exposed to arsenic in Bangladesh.Toxicol. Sci. 135(1), 17-25 (2013). Sumi, D., Abe, K., Himeno, S. Arsenite retards the cardiac differentiation of rat cardiac myoblast H9c2 cells. Biochem. Biophys. Res. Commun. 436(2):175-179 (2013). 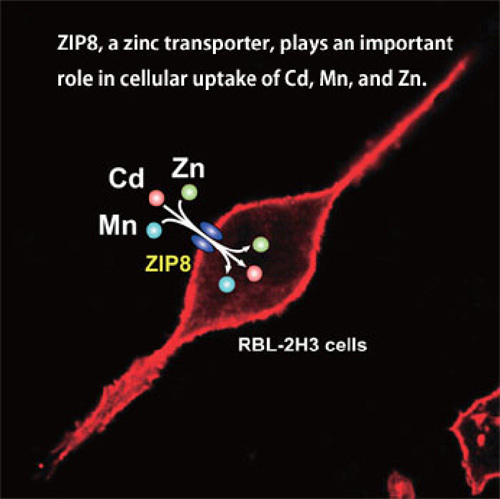 Fujishiro, H., Ohashi, T., Takuma, M., Himeno, S. Suppression of ZIP8 expression is a common feature of cadmium-resistant and manganese-resistant RBL-2H3 cells. Metallomics, 5, 437-444 (2013). Yamamoto, H., Oda, M., Nakano, M., Yabiku, K., Shibutani, M., Nakanishi, T., Suenaga, M., Inoue, M., Imagawa, H., Nagahama, M., Matsunaga, Y., Himeno, S., Setsu, K., Sakurai, J., Nishizawa, M. Concise Synthesis of a Probe Molecule Enabling Analysis and Imaging of Vizantin., Chem. Pharm. Bull., 61(4), 452-459 (2013). Yamamoto, H., Oda, M., Nakano, M., Watanabe, N., Yabiku, K., Shibutani, M., Inoue, M., Imagawa, H., Nagahama, M., Himeno, S., Setsu, K., Sakurai, J., Nishizawa, M. Development of vizantin, a safe immunostimulant, based on the structure-activity relationship of trehalose-6,6′-dicorynomycolate., J. Med. Chem. 56(1), 381-385 (2013). Sumi, D., Shimizu Y., Himeno S. Involvement of Nrf2 activation in the upregulation of S100A9 by exposure to inorganic arsenate., Int. J. Mol. Med., 31(1):259-264　(2013).